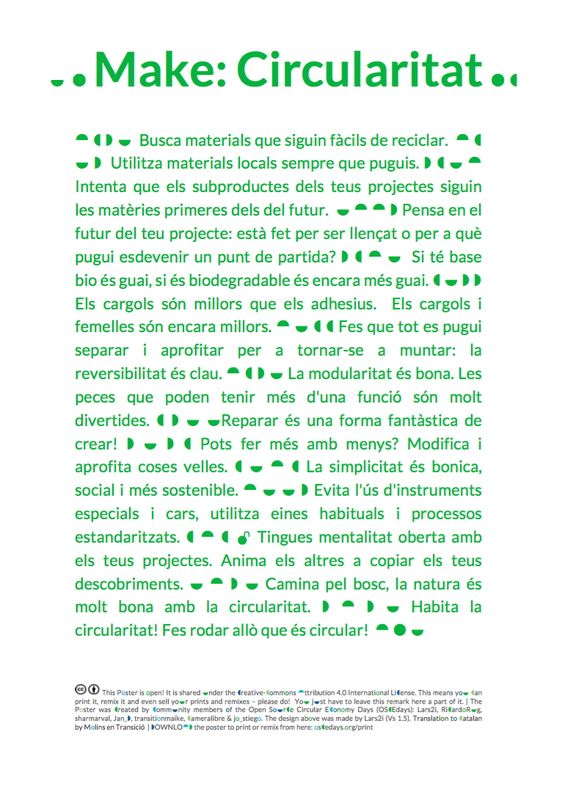 An Open Poster on Circular Making available in *9* languages for download, print, remix & sell. 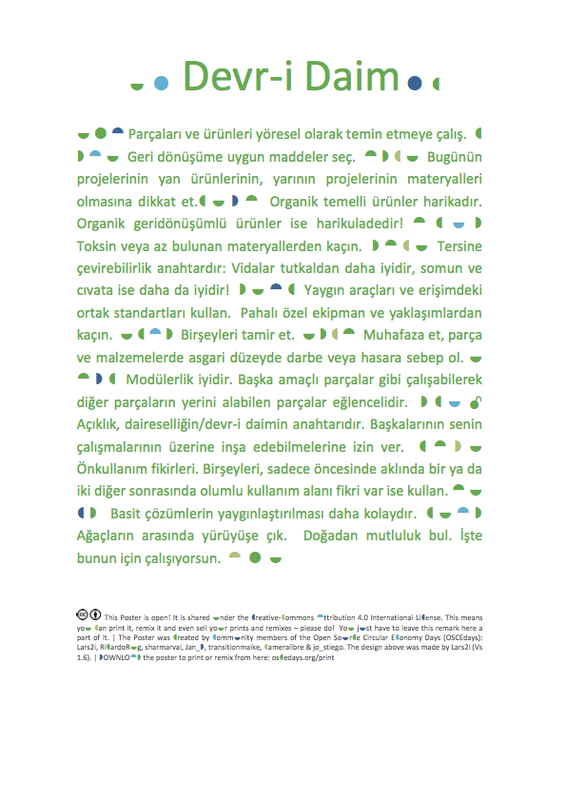 Download to PRINT, REMIX, REDESIGN or TRANSLATE. Hang it up in your School, Maker-Space, FabLab or Company. Feedback welcome below. Do you want to add a missing translation? Just download one of the editable .DOC files above and edit it using Microsoft Word or Libre Office for example. Upload your translation below in a comment (via drag and drop). Please upload also an editable file (.doc or .odt) and a .pdf & .png if possible. The content of the poster might still be in development. Therefor also use - if possible - the english version above to start the translation. You could also go the extra mile and make sure that the design does not break. For this study the design info below. If you want to add a different and more elaborated design of the poster we are very happy about it! Just upload your new version in an editable version below. Thx. I want to put something together on ‚circular making’. I think about two things. 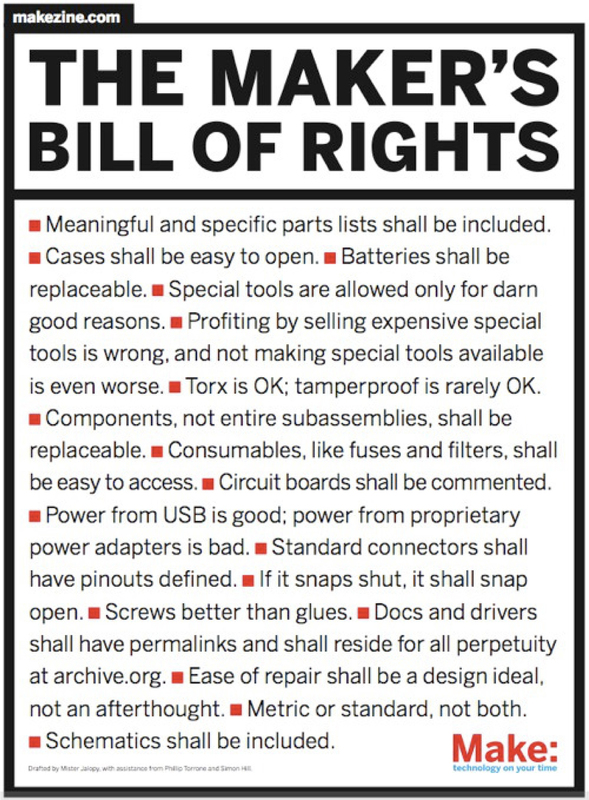 ( 1 ) A simple ‚Instruction sheet’ – like the Repair Manifesto or the Makers Bill of rights (see below) but on circular making. Just a bunch of points to get people started. ( 2 ) In a next stage an **extended** gallery with links to **resources**: Communication & design methods, material libraries, tutorials about circular 3d printing and so on. But the focus for now would be the simple instruction sheet with bullet points to get people googling for things like ‚compostable materials’, ‚renewable materials’, ‚reusable construction’ and so on. Suggestions for bullet points or for websites to look at to find them are very welcome. (Apparently there is close to nothing about this on the web right now ). Pls. post below or mail to me. Circular Make Spaces in Redistributed Manufacturing - by @sharmarval @TechnicalNature @Grit - What have you found out? 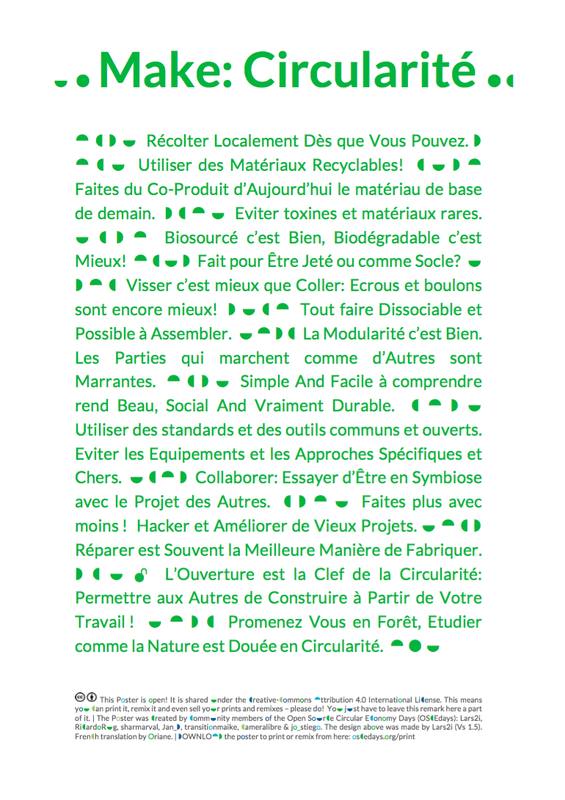 \ (° ▽ °) / – Call For Open Circularity Solutions! with a short descriptions in every point and -as you say- links to best resources available. @Marcvit could you go a bit deeper into that? How could this be translated into bullet points someone who just wants to tinker on a weekend to relax could feel inspired by? 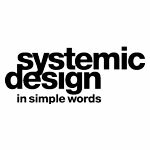 These two websites exemplify how to present in a few words what it means and how systemic design is applied. I think it is a fairly simple and easy to understand the subject and we could in this way list the points we want to show. Systemic Design in simple words. Che cos'è il design sistemico e perché tratta argomenti di cui tutti dovremmo interessarci? Hey, here are some ideas for first points. Any suggestions? Happy about ideas for better language or missing points – or which one could go. I feel like it should not be more than 12. 0 – Some materials are easy to recycle and some aren’t. Pick the first ones. 1 – Make the by-products of your project the materials for your next one. 2 – Screws better than glues, nuts and bolts are even better. 3 – Biobased is cool, biodegradable is even cooler! 4 – Think about your projects future. Made for the bin or made to build upon? 5 – Repairing is making with a ‘re’ – remake! 6 – Do more with less: Hack and improve old projects. Add features to existing things. 8 – Reversibility rules! Make things for dis- and reassembly. 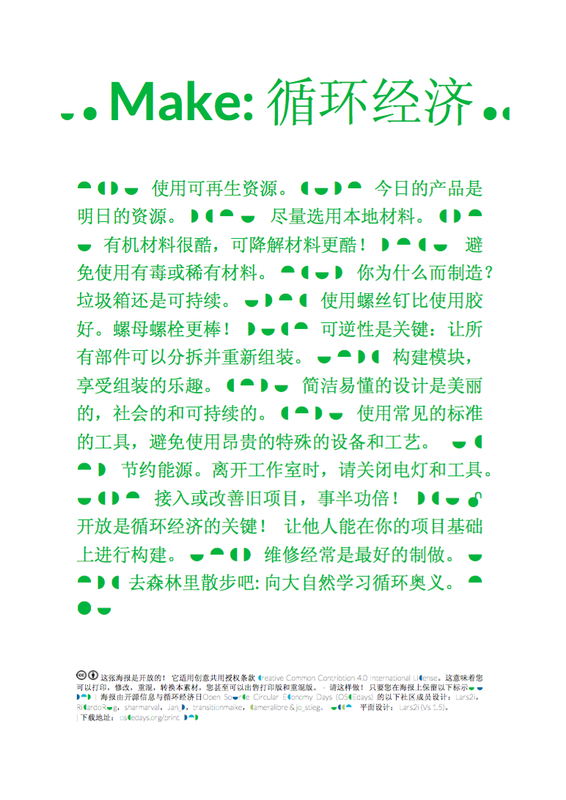 Parts can be separated and reassembled again, ∼ components shall be replacable. 9 – Modularity is good. If it allows interoperability and compatibility it is fantastic. 10 – Use simple and open standards and common tools, sophisticated tools & solutions are barely ok.
11 – Make things open. 12 – Maintain your tools – take good care of your tools, make them longlasting. 13 – Turn off your tools and the lights when you leave your workshop. Save energy. 14 – Share the fun you have doing the above. (_) – Complex is impressive, sure, but simple is beautiful and inspiring. (_) – Go for a walk in the woods. And learn from nature. / Take a break and have a walk in the woods. 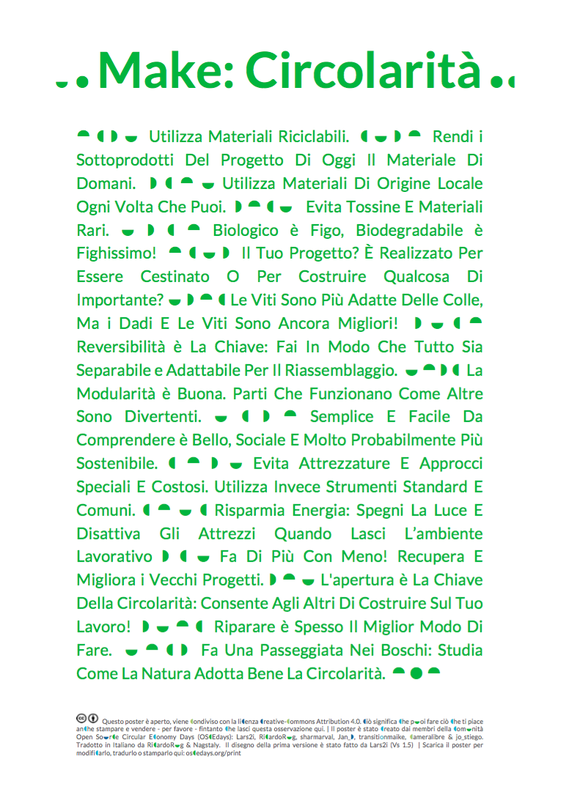 Study circularity in nature. (_) – have a walk in the woods. apply the circularity of nature. 10 – Use simple, and open, standards and common tools, sophisticated tools & solutions are barely ok. Develop the product so that it can be supplied, adapted, modified, reprocessed by others, allowing new actors to connect to a circular economic model. Intelligently use energy and resources, turn off your tools when you do not use them, draw by hand, save every kw of energy you can. ()- Undertake projects together in a collaborative and open way, one head can generate good ideas, many can change the world! ()- Prototype your ideas, take them to a physical plane that allows you and others to understand, adapt and improve them. in the paper everything works, outside the details come to view. ()- Document the process of your work; can serve you to improve it, can serve others to apply it. Sketches, plans, photographs, tests, everything that you consider important share to the world. I know it have to make them more concrete, but leave the idea. 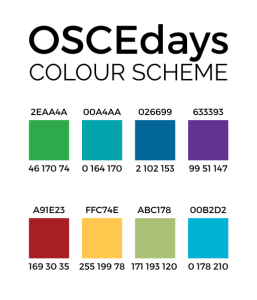 On the other hand, what do you think if we apply the same system, graphic, poster or infographic for all OSCED tools? : action protocol, documentation, activity development, collaborative work, etc. If I remember correctly in the first event, something similar was done for the document that explained how to document the activities. Is this aimed at any person or org doing circular making, or more focussed on maker spaces and circular making within that context? I thought it to be for the latter. Just hobbyists and tinkerers. I think for organisations there are enough resources around on the topic. 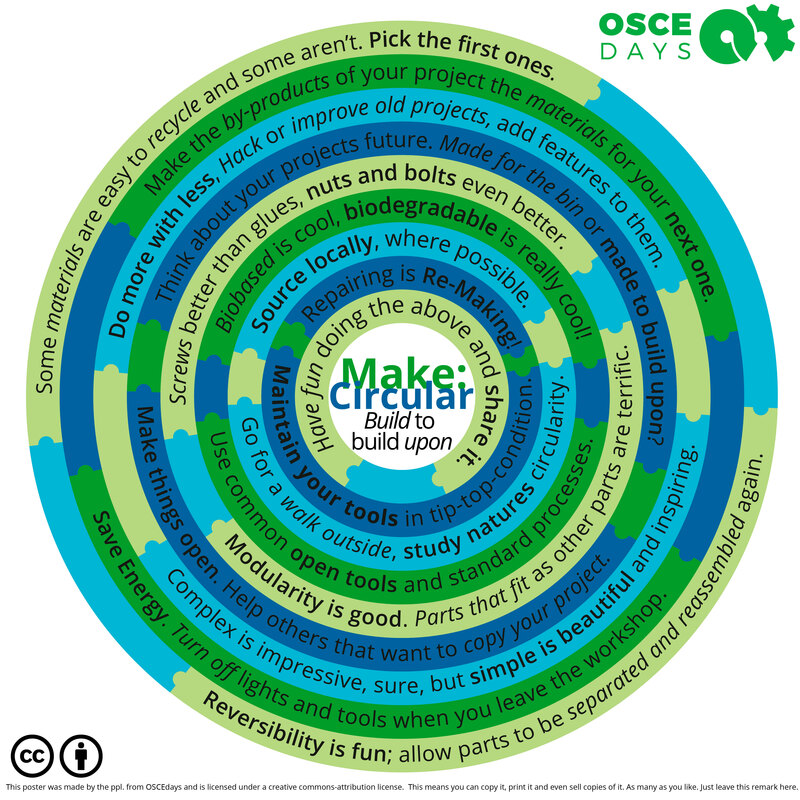 The idea came when we discovered the OSCEdays Berlin will happen at the same time as Maker Faire Berlin. How to combine the two events - create synergies between them. 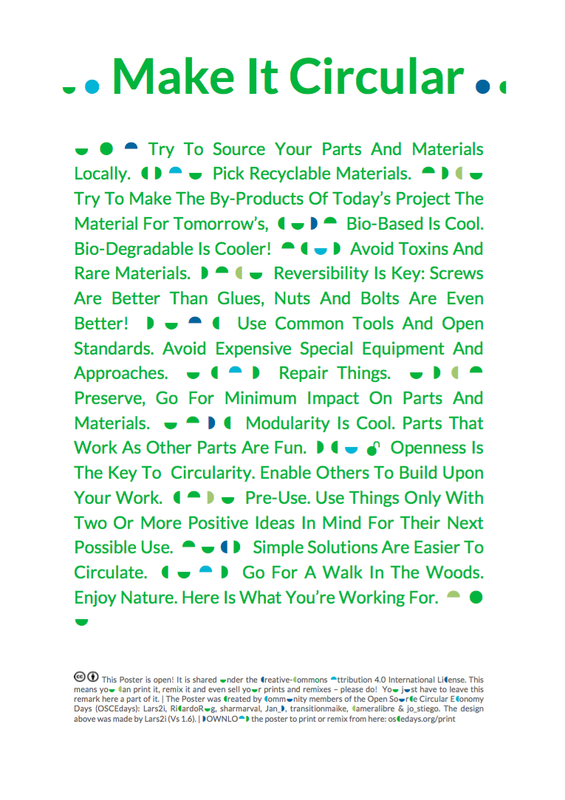 Just a poster … made for hobbyists, who enjoy making in their free time. In the past decades there was a lot of debate about the ‘political’ or ‘economically’ power of ‘makers’. But if you go to a Maker Faire you see nothing of this. These are mostly just people having a hobby, just playing. It is a well working consumer-thing, perfectly fitting capitalism and linear economy. So the poster should be something easy and fun and inspiring just putting circular making on their radar without trying to force them… to save the world or something. If the poster is done and well designed it could hang on the wall of fablabs and maker spaces. Just some “background” noise that might inspire a search or idea here and there. what do you think if we apply the same system, graphic, poster or infographic for all OSCED tools? : action protocol, documentation, activity development, collaborative work, etc. true, @cameralibre made this poster. Good idea to extend the poster idea to supply events with content. I have already something in mind for the circular making poster. But let’s develop it first - I am on the next iteration. Thanks for the feedback and contributions in this and other channels. Working with it I created a new iteration – see below. But before some explanations about the direction. What is it aiming for, who is it for? For hobbyists: As explained in the comment above. The target group should be makers and people who love building things but don’t connect it to sustainability or politics and don’t have an interest in doing so. The Maker Faire audience. Don’t burden them with the responsibility to ‘change the world’ – someone who wants that will understand that the list is also about that. Let’s not burden them with the task to ‘create meaning’ for others. All they should care about is that it means something to them. If it really does, chance is high, it means something for others too. Therefore it should be simple, straight and without much complex explanation. It should sound like an interesting challenge or question – own thought and search (!) inspiring. No boring tasks like demanding extended documentation for hypothetical and political motivated effects. If people are proud of what they have done they will share it anyway, the way they love to. Also if it is for hobbyists it should not talk about ‘products’. ‘Products’ – that sounds like work. If you think your project is cool and you are an entrepreneurial person the idea to make it a product will pop up naturally. If not, just enjoy yourself as a creative person. Ok, here is the new iteration of the bullet points. Probably they need to be in a different order. Some materials are easy to recycle and some aren’t. Pick the first ones. Make the by-products of your project the materials for your next one. Screws better than glues, nuts and bolts even better. 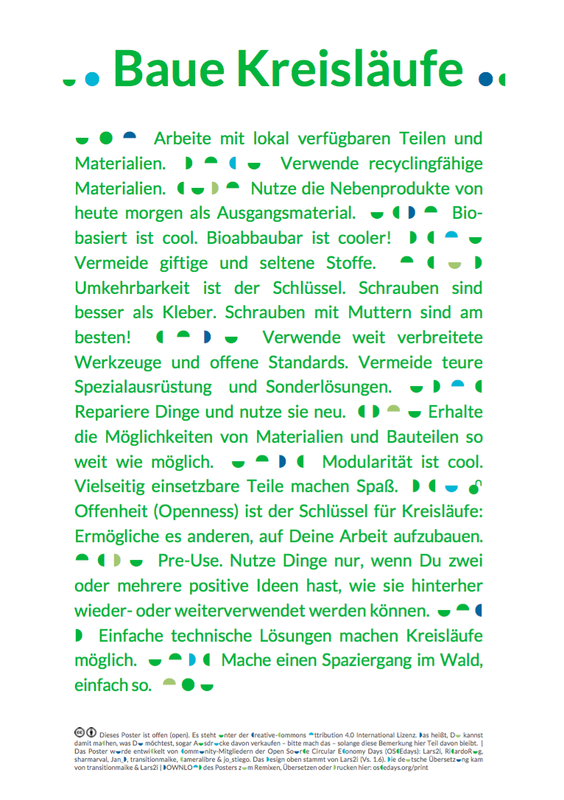 Biobased is cool, biodegradable is really cool! Think about your projects future. Made for the bin or made to build upon? Reversibility is fun; allow parts to be separated and reassembled again. Modularity is good. Parts that fit as other parts are terrific. Complex is impressive, sure, but simple is beautiful and inspiring. Make things open. Help others that want to copy your project. Maintain your tools in tip-top condition. Save Energy: turn off lights and tools when you leave the workshop. Have fun doing the above. And share it. let’s try to shorten the sentences into something that can stick in the mind as a slogan. I myself will wait a few more days till I get back to the sentences to get a little distance - and a fresh eye. Makes it easier to improve. Some materials are easily recycled. Some not. Pick the first lot. Biobased is cool, biodegradable is cooler! Modularity? You should! Parts that work as other parts are good. Use the by-products from one project as the materials for another. Reversibility is clever; allows parts to be separated and reassembled forever! btw. I am on a new iteration - including all feedback and suggestions. 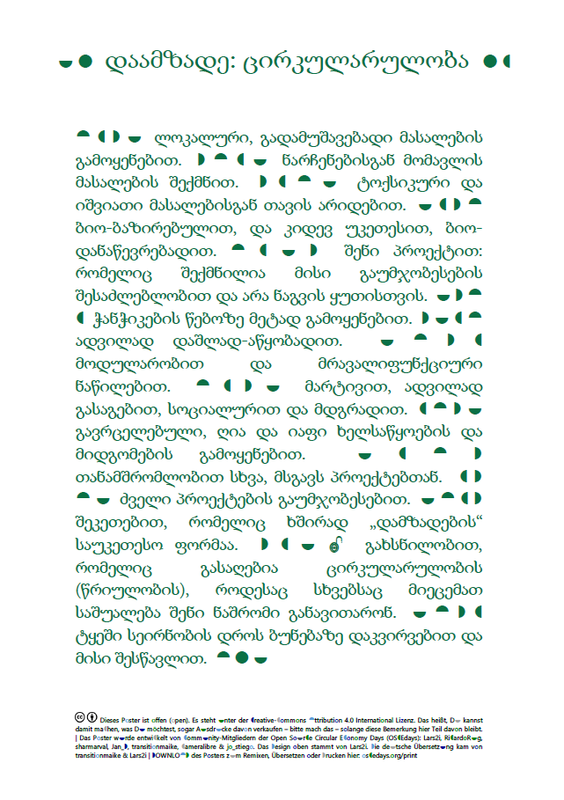 Here is a new iteration of the text. As short as possible! Maybe too short now. We should check if the sentences still make sense to new people. And add back in stuff where necessary. @sharmarval @seigorobinson @Silvia @Gien @transitionmaike – or any other native english speaker – could you pls. check the language and post a comment if you find something that needs to be corrected. Some materials are easily recycled. Some not. Pick the first ones. 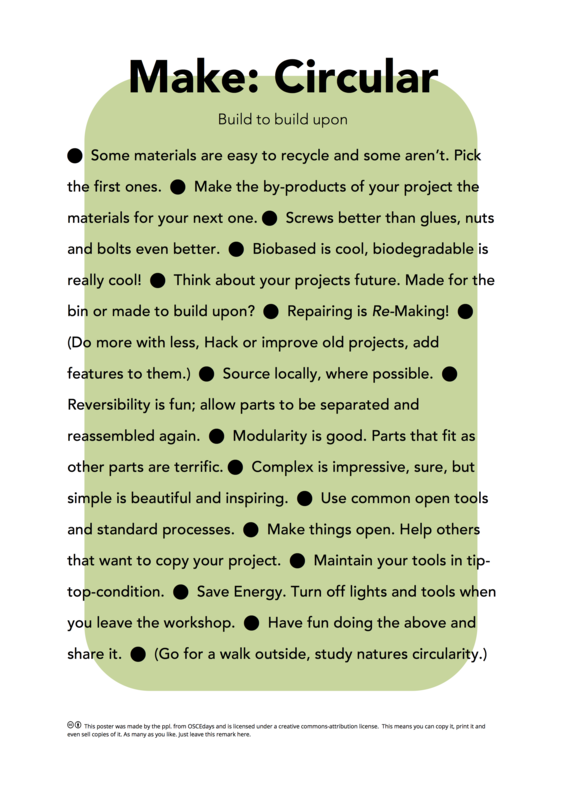 Think about your project’s future: Made for the bin or made to build upon? Allow the by-products of today’s project to be the source for tomorrow’s. Screws better than glues. Nuts and bolts even better. Modularity is fun. Parts that work as other parts are good. Reversibility is clever. Make everything separable and fit for reassembly. Repairing is a great kind of making! Simple is beautiful, social and more sustainable. Avoid expensive special instruments and approaches, use commonplace tools and standard processes instead. Hack and improve old projects. Do more with less. Be open about your work. Help others to copy your findings. Walk into the woods, nature is good at circularity. 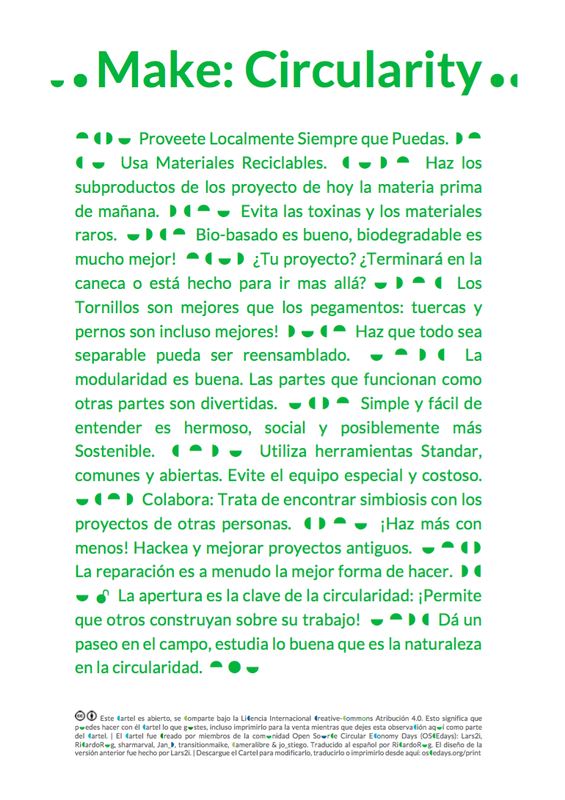 Inhabit Circularity! Circulate the circulated. Inhabit Circularity! Recycle the recycled. Reuse the reused. Repair the repaired. Hack and improve old projects. Do more with less. I find “Do more with less” too generic. The sentence before on its own is sufficient.